JACKSONVILLE, Fla. - Jacksonville Jumbo Shrimp right-hander Dustin Beggs pitched a complete game but lost a 3-0, seven-inning final to the Mississippi Braves, before Jacksonville right-hander Robert Dugger pitched a one-hit, seven-inning shutout in a 1-0 win that included an in-game Baptist MD Anderson Cancer Center Home Run for Life in front of 7,263 at Saturday's doubleheader and Total Air Care Military Appreciation Night at the Baseball Grounds of Jacksonville. In Game 1, Beggs (1-2) retired the first seven batters before Mississippi (37-30 second half, 66-71 overall) rallied to take the lead. Shortstop Ray-Patrick Didder singled and went to second base on Beggs' errant pickoff throw. Braves pitcher Ian Anderson grounded to first base to advance Didder to third base. Beggs walked center fielder Connor Lien, before second baseman Alejandro Salazar hit an RBI single to right field. Beggs kept the deficit at 1-0 until the seventh inning, when third baseman Daniel Lockhart and catcher Jonathan Morales hit consecutive singles and both scored on pinch hitter Luis Valenzuela's two-run single to right field. Beggs allowed two earned runs on seven hits and one walk with seven strikeouts. Braves right-hander Ian Anderson (2-1) pitched six shutout innings, allowing two hits and two walks with 10 strikeouts. Left-hander Thomas Burrows struck out the side in a one-hit seventh inning for his fifth save and a 3-0 Mississippi win. In Game 2, Dugger (7-6) held the Braves hitless through 4 1/3 innings. In the fifth inning, he hit catcher Carlos Martinez and right fielder Brandon Downes, before shortstop Ray-Patrick Didder singled to left field. Martinez tried to score but was tagged out by Jacksonville catcher Rodrigo Vigil on a throw from left fielder Brian Miller. 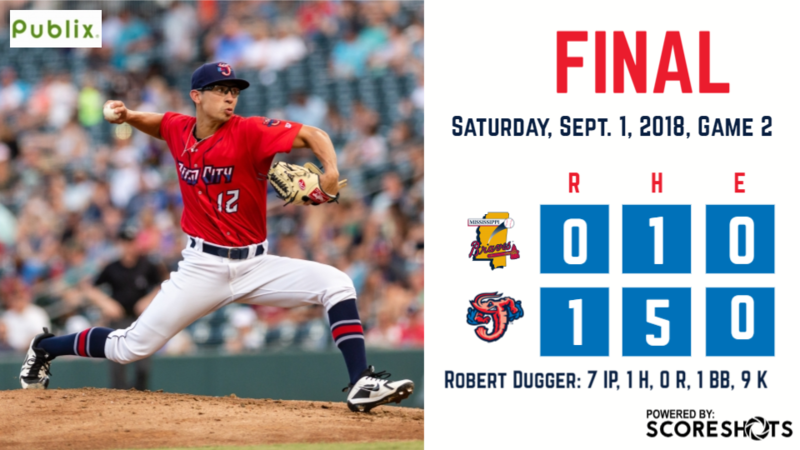 Dugger then retired the final seven batters to complete his Southern League-leading second shutout and third complete game. Mississippi left-hander Ricardo Sanchez pitched four scoreless innings, and left-hander Justin Kelly pitched one. In the sixth inning, right-hander Jason Hursh allowed a leadoff single by Jacksonville right fielder John Norwood. Third baseman Brian Schales popped out on a bunt, and first baseman John Silviano grounded into a fielder's choice. Vigil then chopped a double down the third-base line to score Silviano for the only run of the doubleheader by the Jumbo Shrimp (27-41, 55-81). UP NEXT: The Jumbo Shrimp conclude the season against Mississippi at 2:05 p.m. Monday, when Jacksonville right-hander Cody Poteet (3-11) is scheduled to face Braves right-hander Enderson Franco (5-9). Gates open at 1 p.m for Fan Appreciation Day with prize giveaways throughout the game. For VyStar Credit Union Charity Begins At Home, VyStar Credit Union members can get a buy-3-get-1 free ticket special by showing their VyStar credit or debit card at the box office. Labor Day will include a pregame labor unions parade. The City of Jacksonville's Fight Blight office is teaming up with the Jumbo Shrimp for "Don't Trash Jacksonville". It is also Half Price Yuengling Monday. ABOUT THE JUMBO SHRIMP: The Jacksonville Jumbo Shrimp offer affordable family fun at the Baseball Grounds of Jacksonville. Their inaugural season garnered the Southern League's Don Mincher Organization of the Year, Promotional Trophy, and Jimmy Bragan Executive of the Year, won by General Manager Harold Craw. To experience the excitement with the terrific value of ticket and group options, call the Jumbo Shrimp at (904) 358-2846 or visit www.jaxshrimp.com.